My 4 year old grandson does not like the big shower. He gets very upset and tells me he's afraid of it. We often have lots of chaos at bath time if he thinks we are going to turn the shower on. I had the opportunity to review the My Own Shower from Rinse Ace. I had hopes we might have a solution to calm our boy's fears of the shower. I also hoped that by calming his fears with the My Own Shower, we could cut bath time in half on the nights we have very little time. 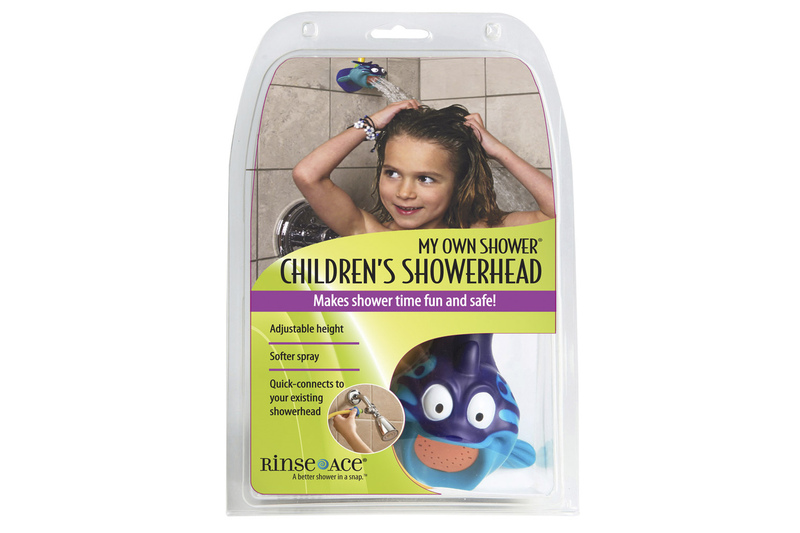 The Rinse Ace shower head for kids places a small shower head at just the right height for a kid to shower. It's fully adjustable height will grow with their child making showering fun and easy with a soft spray. The My Own Shower connects directly to your current shower, included is an adapter and everything you need for installation. You will not need to go out and buy anything. The installation process is super simple and took less than 5 minutes. After the My Own Shower is installed you won't have to do anything else, just connect the hose to the adapter on your shower head with a simple click then turn the water on. There have been no no leaks when the My Own Shower is hooked to the adapter. When you need to use your own shower head, unhook the My Own Shower from the adapter. I like that the My Own Shower has a suction cup so that you can adjust the height. My grandson is loving his new shower. He still make sure to remind us he does not want the big shower head to come on, but he is getting more and more comfortable all the time.I think that it helps he is not getting so much water in his eyes, and the spray of water is soft. The shower head character is so cute, and he really likes it. I'm really happy that this is helping to soothe his fears about bath and shower time. "Does your child hate taking a shower? Kneel down on the showerfloor once and see if you like your own shower. At the child’s height the water spray is wide and diluted and water is much colder. To make a shower for kids fun, the Rinse Ace My Own Shower is the best solution. This kids shower brings the showerhead down to their level with a fun dolphin or blowfish character with a soft gentle spray. Place the suction mounted kids showerhead just at their height and you will have no more tear"
We have used this with our kids! They absolutely love it! ALSO it makes a great diaper sprayer for cloth diapers!